Objective: Use safe practices to prevent falls. Review the information provided on safety practices to prevent falls. Discuss problem areas in greenhouses, nurseries, and other environments. Have a worker demonstrate safe ladder practices. For more information on preventing falls, refer to the Tailgate Safety Training modules Proper Use of Ladders, Tree Pruning and Ladder Safety, and Preventing Falls From Trees. Falls can cause serious injuries, as well as damage to facilities and equipment. Workers can fall off things or fall into openings. They can trip over obstructions or lose their footing on slippery surfaces. Some basic guidelines can help prevent falls. Add rubber mats to smooth-finished concrete floors. Use absorbent material to reduce slipping. Dry floors to prevent slipping. Be aware of the work environment, personal safety, and the safety of co-workers. Floor openings should be guarded by a standard fixed railing on all exposed sides. Consider using a sturdy hinged floor opening cover with removable standard railings on all exposed sides in high traffic areas. Workers should use an access ladder to get up on scaffolds; they should not climb the side of the scaffold. Use a ladder with two side rails joined by regularly spaced steps, rungs, or cleats, allowing for up and down movement. Never extend the body outside the ladder side rails. For every 4 feet of rise, the base of the ladder should be 1 foot away from the object the ladder is resting against. Use the Four-to-One Rule to place the ladder. Place the bottom of the ladder 1/4 of its vertical height from the building (i.e., 4 feet for 16-foot ladder). 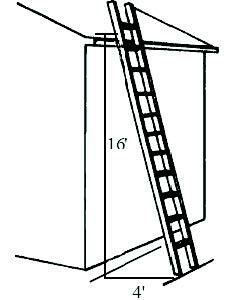 The top of a lean-to ladder should be 36 inches higher than the level at which the employee is working. Do not stand on the top two rungs of a stepladder. Observe the location of electrical wires. Stay clear of electrical lines and lighting fixtures. Keep metal ladders away from electrical wires. Watch out for movable equipment like portable benches or traveling booms. Scaffolds are temporary, elevated platforms used for supporting workers and/or materials. Scaffolds must have guardrails and toe boards. Guardrails are a barrier secured to uprights and erected along the exposed sides and ends of platforms to prevent falls. Greenhouse and nursery workers often use mobile scissor lifts in performing their jobs. If you use this type of equipment, be sure to follow the equipment safety instructions. Make sure all handrails and other safety devices are in place and operating. Be aware of other workers in the work area. Be aware of uneven surfaces as you move the lift. Be aware of beams, trusses, and gutters that may be below head level. Open, exposed stairs should have a railing. Handrails should be provided on at least one side of closed stairways, preferably on the right side descending. Uncluttered stairways with good tread are safest. You are more likely to slip when rushed or distracted, so do not run. Avoid rapid changes of direction. Wear shoes with pliable soles and low heels. Close open drawers, cabinets, doors, or closets after use. Keeping the work area free of spills helps prevent slips and falls. All open spaces should have a fixed railing around them. Always use an approved ladder. Scaffolding must have guardrails and toe boards.